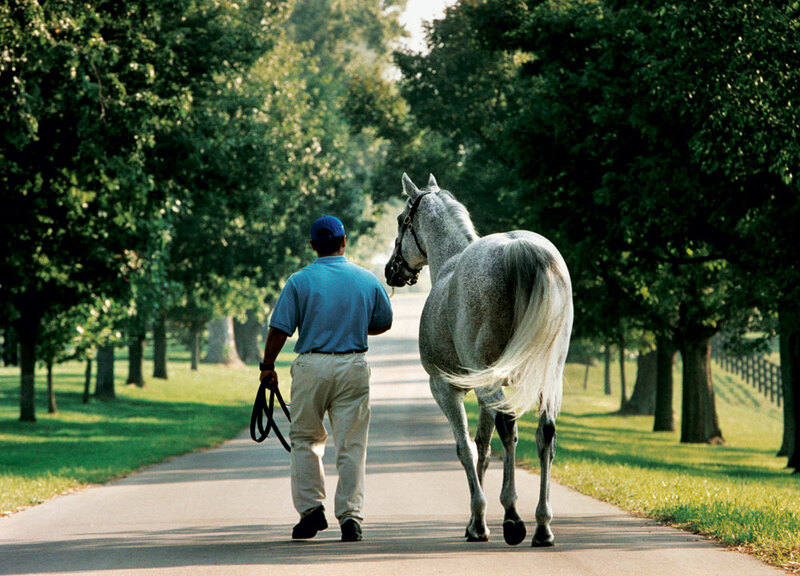 One of the best racehorses in the last quarter century and a firm favorite with racing fans, Holy Bull has succumbed to the infirmities of old age and was put down on June 7 at Jonabell Farm, his home since his retirement to stud in 1995. Godolphin USA President Jimmy Bell, whose family owned Jonabell prior to Sheikh Mohammed’s purchase in 2001, said, “If you were putting together your fantasy horse stable for the last 25 years, you’d have to have Holy Bull in your top five. Horses like Holy Bull just don’t come along that often. I’ve always said, he wasn’t a specialist – short, grass, long or dirt. Just a fantastic racehorse. You can’t mention his name without using such words as ‘fighter, determination and guts.” He continued, “the whole story of Holy Bull, Mrs. Carpenter and Jimmy Croll, jockey Mike Smith. . . it was just a sensational ride. No doubt, at the time, Holy Bull was an icon for our family farm." Throughout the final eighth of the Woodward Stakes, regular NYRA race caller Tom Durkin’s tone of disbelief of what he was witnessing summed up the emotion all who watched the big gray, as he blared out, "Holy Bull winning like a champion...with devastating ease! Holy Bull toying with the best horses in training.” At the end of the year, Holy Bull was assigned 130 pounds on the Daily Racing Form Free Handicap, the highest for a three-year-old in 15 years, and a front page headline of “Bullmania Sweeps the Nation." Holy Bull’s original owner, Rachel Carpenter, bequeathed all of her horses to Jimmy Croll who was the owner of record for Holy Bull’s first start in 1993. He won all four races as a two-year-old, including the G1 Futurity Stakes at Belmont Park over eventual Champion two-year-old Dehere. At three, he won five G1 events – the Travers Stakes, Woodward Stakes, Met Mile, Haskell Invitational and Florida Derby – and was voted the best three-year-old of that year and was also named Horse of the Year. In his eight wins during that 3YO season, Holy Bull's average Beyer figure was over 115. He retired with an overall record of 13 wins from 16 starts and earnings of $2,481,760 and was inducted into the Hall of Fame in 2001. At stud, his six individual G1 winners include Kentucky Derby winner Giacomo, champion and Breeders Cup Juvenile winner Macho Uno, now a successful sire, in addition to Flashy Bull. Ironically, it was Holy Bull’s jockey Mike Smith that guided Giacomo to victory. Holy Bull's average earnings per starter remains at $65,000, while his career statistics show a 74 per cent lifetime winners to starters ratio. Holy Bull has made a major impact through his daughters, who have produced over 50 Stakes winners including the likes of unbeaten G1 winner Caravaggio, Judy The Beauty, Munnings, and Cairo Prince. Holy Bull will be buried at Jonabell.